An iPod, iPhone or even an iPad is the last place you’d expect to find a shooting game, let alone an actually decent shooter for free. Star Warfare does exactly that…(well almost). The storyline for the game is fairly generic: humans in space are harvesting minerals in outer space…when suddenly, out of nowhere, aliens attack! Your character must now defend the remaining human colonies from these invaders. Star Warfare offers two game modes: single player (campaign) and multiplayer. The campaign is pretty straight forward, just jump right in and start blasting away at the hordes of aliens coming your way. There are seven playable maps, each consisting of five levels along with and an infinite mode. 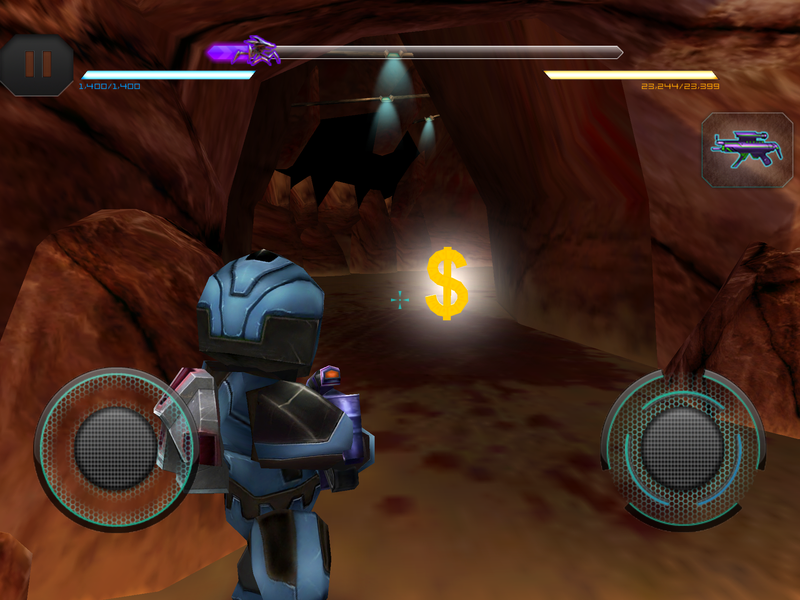 The more aliens you blast, the more money you get that allows you to purchase and upgrade your weapons in the store. Aliens will also drop some goodies that you can pick up to score some extra cash. There are seven playable maps, each consisting of five levels along with and an infinite mode. To add more of a challenge there are three boss battles included within the campaign. Players can choose to face the bosses when they feel that they are ready. Your only objective is to stay alive and defeat all of the enemies in a given level. Aside from the infinite mode, the boss battles are one of the most challenging parts of the game. For a free game, Star Warfare’s multiplayer exceeds expectation; it is a nice break from just running and gunning down aliens. 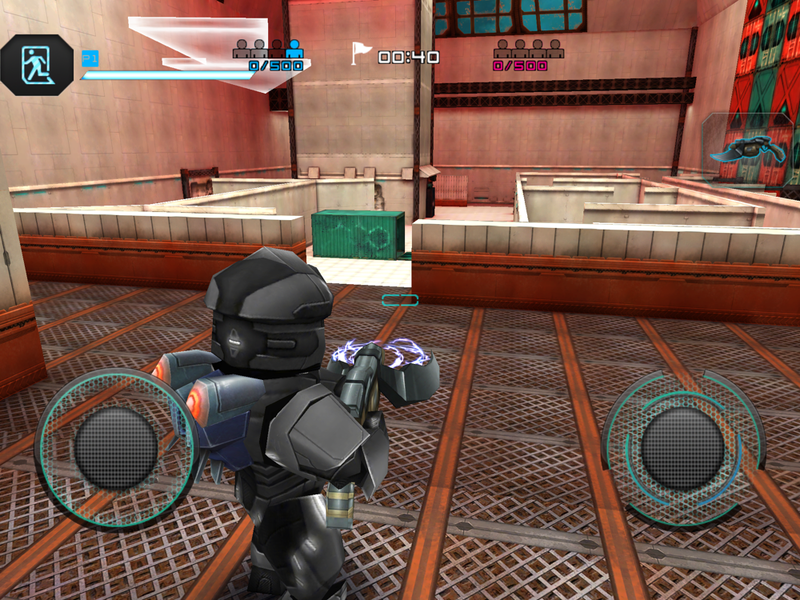 With five different game types to choose from, players can either face each other in versus modes such as capture the flag or stand together in cooperative boss levels. Along with various game types, there are different maps players can face each other on. Each map has its own vantage points as well as scenery that adds to the overall experience. Another great part about this game’s multiplayer is that it rewards you for each day you go online. After the first three days you start earning mithril, which is a secondary form of game currency. To be fair you have to go into this game’s multiplayer expecting to die… a lot. Like many other online multiplayer games you will be facing more experienced players with better weapons and gear. But don’t worry, Star Warfare rewards you for each day you go online. After the first three days you start earning mithril, which is a secondary form of game currency. In terms of customizing your character, Star Warfare offers a ton of weapons and armor sets to choose from. From heavy machine guns to shotguns, and even laser cannons, this game definitely has an arsenal that will fit your needs. The armor sets also have different attributes that can boost your stats on the battlefield. The in-game store offers a handful power-ups you can use to increase your attack, defense, and speed. These can be very helpful when it comes to fighting bosses or even getting through a new level that you have just unlocked. If you’re looking for some serious firepower, the weapons that can dish out some serious damage are going to cost you some mithril, the secondary currency of Star Warfare. For starters, mithril isn’t that easy to come by. You can either purchase it with real money, or you can earn it by simply going onto multiplayer. But when you do get enough of it, you can unleash your fury upon hordes of aliens. You can also use mithril to buy better armor for you character;there’s even a backpack that allows you to however above ground and not take any damage from ground creatures. These “mithril-only” items can certainly benefit you in the long run, but you’ll have to dedicate yourself to the game. Star Warfare: Alien Invasion certainly does exceed expectation as a free shooter. It has a huge array of weapons to choose from, several maps to choose from, and even a variety of enemies to keep you on your toes. One problem with the game is that all of the items in the store are very pricey. You’ll have to repeat some missions over and over if you want to upgrade your character. Another problem is that all of your saved data is erased after upgrading to iOS 7; a very frustrating occurrence indeed. This game gets an 7.5 out of 10. 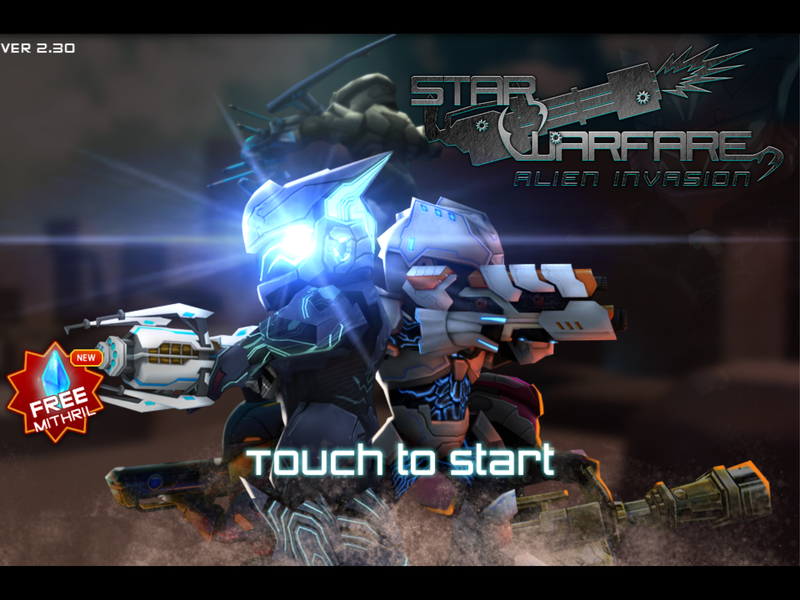 Star Warfare: Alien Invasion is free to download and play on the Android Market and on iTunes.